Discover the aesthetic benefits of getting this cosmetic procedure. Do you find your smile less-than-attractive because you feel like the only thing you see when you smile are your gums? This look is often referred to as a “gummy smile,” and while this issue is purely cosmetic we understand that it can make people feel embarrassed by their appearance. If you are someone who is dealing with this problem, our Jacksonville, NC, dental implant specialist, Dr. Jose Arauz, can help with cosmetic gum surgery. When gum tissue looks like it’s taken over, it’s difficult to see those beautiful pearly whites that you have. This is where cosmetic gum surgery comes in. This procedure can help correct this imbalance and improve the shape and contour of the gums while improving the length of the teeth to make your smile more even and attractive. Of course, sometimes people are dealing with the opposite problem where their gums have started to recede, making teeth appear longer. 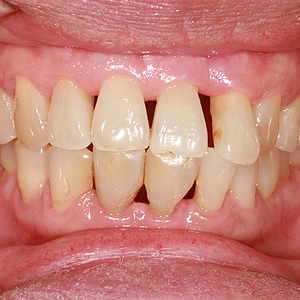 Receding gums can be a warning sign of something more serious such as gum disease. Of course, something as simple as brushing too hard could also lead to receding gums. Visiting your Jacksonville dentist at the first sign of gum recession is important, especially if the cause is gum disease. Regardless of whether you have excess gum tissue or a receding gum line, cosmetic surgery may be the best approach for improving your appearance; however, if we do detect gum disease we will need to treat that issues and get your condition under control before we perform any cosmetic dental procedure. In the situation of gum recession, we perform simple grafting techniques that involve removing some tissue from the roof of the mouth and placing it on the receding areas of the gums. Over time, this will stimulate the growth of new cells and with it new gum tissue. For those with gummy smiles, the process is a little simpler. We will only need to remove some excess gum tissue from these areas to reveal more of your teeth and to improve symmetry and also evenness. Gum surgery may also be used along with other options, such as braces or veneers, to greatly improve and enhance your smile’s look and shape. Do you want to feel confident in your smile again and think cosmetic gum surgery could be the solution you’ve been looking for? If so, it’s the perfect time to call our Jacksonville, NC, dental office and schedule a consultation with us. If your gums are starting to recede find out what might be going on. Have you suddenly noticed that your teeth are starting to look longer and that your gums have started to pull away from your teeth? If so, you may be wondering what’s going on and whether this warrants a trip to visit our Jacksonville, NC, general dentist, Dr. Jose Arauz. We are here to tell you why you might want to pick up the phone and give us a call if you notice these changes in your gums. So, what exactly do receding gums actually mean? Well, it could be warning you that you have gum disease, a chronic bacterial infection that can kill healthy gum tissue and even go as far as to cause tooth and bone loss. If you are noticing receding gums then you could be dealing with gum disease. If this is the case it’s important that you visit our Jacksonville dentist right away for treatment. How will my dentist treat my gum recession? If you have only minimal gum recession then coming in for a professional deep cleaning may be all you need to get your gums back on track and healthy again. During this cleaning, we will remove plaque and tartar buildup from your teeth, gum line and even tooth roots. If you are dealing with severe gum recession then we may need to perform gum grafting surgery to improve the shape and contour of your gums. Remember, the sooner you seek treatment the better. When in doubt about your oral health, give us a call and ask. Your mouth will thank you. If you notice any changes to your gums, it’s important that you get the issue checked out right away. And if you are dealing with tooth loss, it’s time to call our Jacksonville, NC, dental implant specialist right away for a consultation.